The bag that I'm using at the moment is a Ralph Lauren Orange Laser Cut out tote bag, I actually couldn't find this bag on the website as i think its now been discontinued which is a shame because I love this bag, its small enough that you don't fill too much into it and it also fits everything that you need. 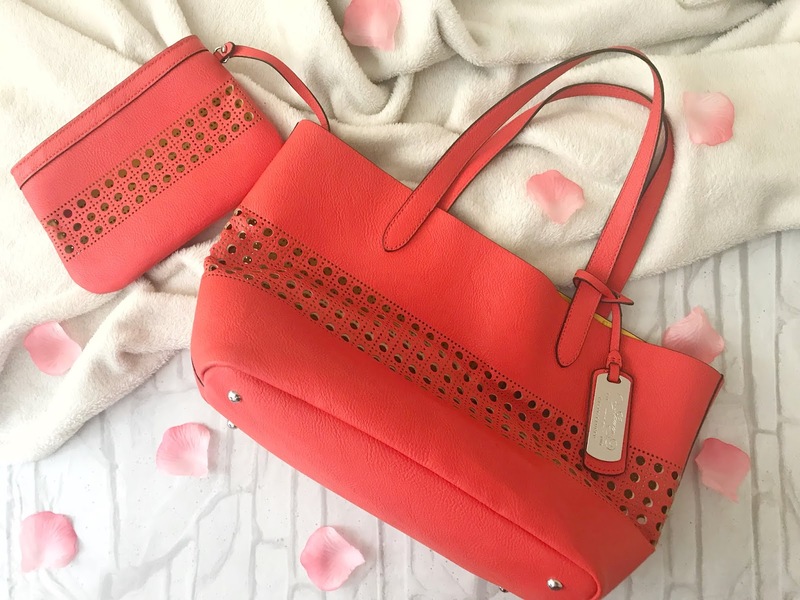 The colour is actually my favourite part of the bag, it doesn't go with every outfit because of its vibrant orange colour. 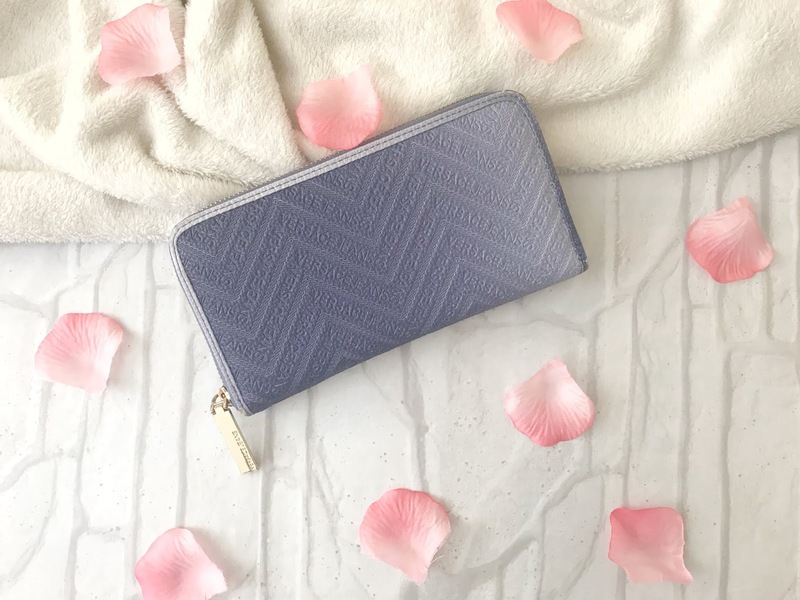 This bag also has a smaller pouch inside which is detachable and can be used for storing cards or any smaller items you need to put into the bag. The only drawback about this bag is that it doesn't have a zip or a button to keep it closed but if you're not overloading the bag it doesn't affect it too much. The purse I've been using recently is a Versace Jeans Blue Zip Around purse which I got for my birthday. I've also had this purse for a while so I found it on Ebay here. This purse doesn't really match my bag but I love it and it fits everything I need so I've been using it for months. Inside the purse you can fit 8 cards (mostly store points cards), There's a zip in the middle for change and 3 main compartments for cash or receipts. I've had purses in the past that are just too small but this one fits everything I need as well as all the receipts I forget to throw away. This is only a small edited version of my makeup bag that I take to work every day. 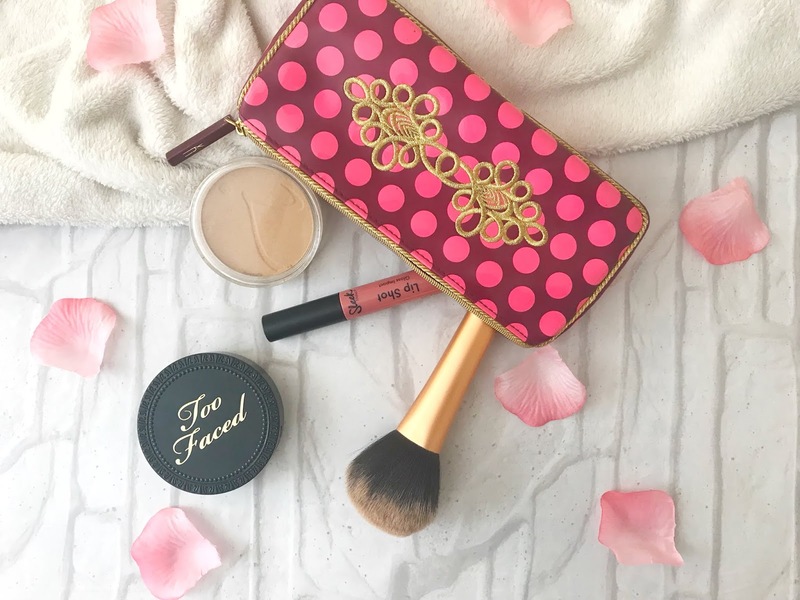 I usually change up my makeup bag pretty often and now that the weather is a lot hotter I just take my Jane Iredale Pure Pressed Powder in Latte, I love to use this as a base instead of liquid foundation because it just feels like your not wearing any makeup and also add enough coverage that I like which is medium-full coverage. The other powder that I have in my makeup bag which is the Too Faced Cocoa Powder Foundation in Medium, I mainly use this powder just too matte my skin if I'm getting a bit shiny (I actually got this powder from Tk Maxx for just £7.99, perfect for bargains on high-end brands). 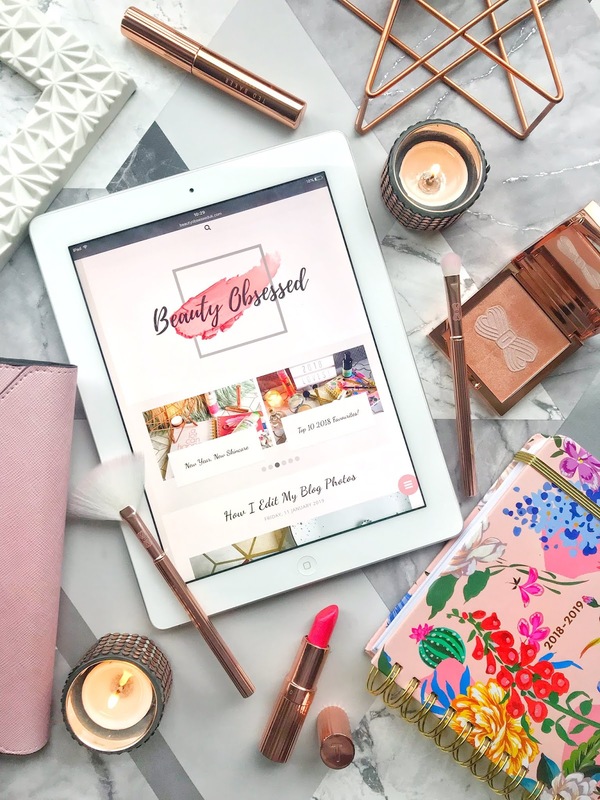 I also carry the lip product that I have been using for the day, I usually wear a different lip colour each day but the one in my bag today is the Sleek Lip Shot which is a highly pigmented lip gloss that you can find in my Highstreet Makeup Haul. The last item I have in my makeup bag is my Real Techniques Powder Brush which I cannot live without! Click here to see my full post on What's In My Everyday Makeup Bag. While writing this post it is currently 25 degrees and it is essential that you bring your sunglasses with you everywhere that you go because it's so bright out. Recently I did a post on some Accessories that I purchased from Primark and these sunglasses were one of my purchases. These glasses were only £2 and are perfect for this really sunny weather because the lenses are quite dark. The design is really nice with a gold bar at the top which I've been seeing a lot this summer and these glasses are also really comfortable to wear. I cannot go anywhere without my headphones, even if its just a small trip they are always in my bag. I have an iPhone 7 so these headphones came with it (don't get me started on the silly design of these). 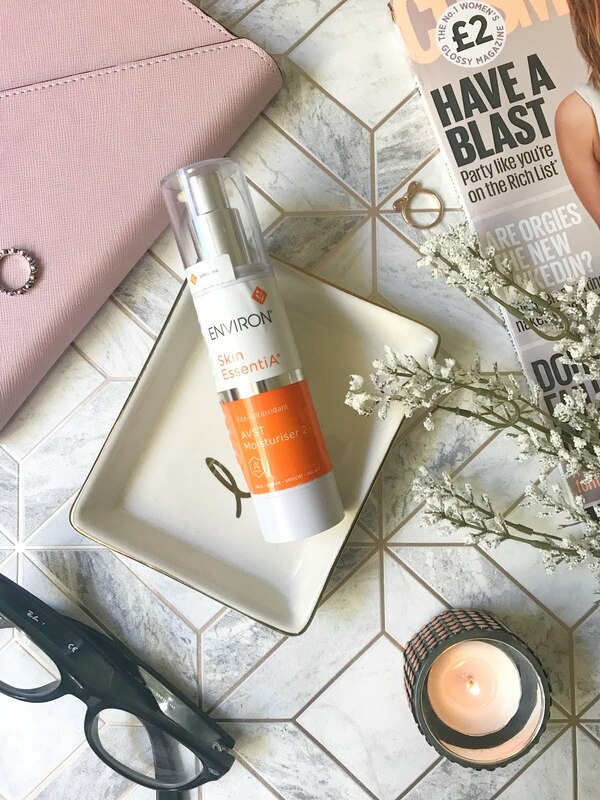 I think I've spoken about this product before on my blog and I absolutely love it, I use it multiple times a day because I really am a germ freak! I have tried all different antibacterial gels before but have only repurchased this one because it smells so amazing and doesn't have a clinical smell like other gels I've tried. This gel also sinks into the skin really quickly and doesn't dry out the skin. Recently I signed up to be a part of #babesofglory with Soap & Glory and was very kindly gifted this Hand Food Hand Cream in Crush. I have tried the original scent which I loved but this one is so fresh and citrusy that I also love it. This cream has a non-greasy formula so it doesn't make your hands feel to slippery or greasy once applied. It also soaks into the skin quickly leaving your hands hydrated. I always have to carry a lip balm in my bag just encase of dry lip emergencies. I have been using Malibu lip balms for years now and love how soft they make my lips, Sometimes I even like to wear this lip balm under liquid lipsticks or matte lip products. I have been loving the Strawberry scent recently. I'm always switching up products and items in my bag but a few of these are my holy grail items that I need daily. What products do you need in your bag daily? Love love love soap and glory hand food! Its just the best! carry it everywhere! 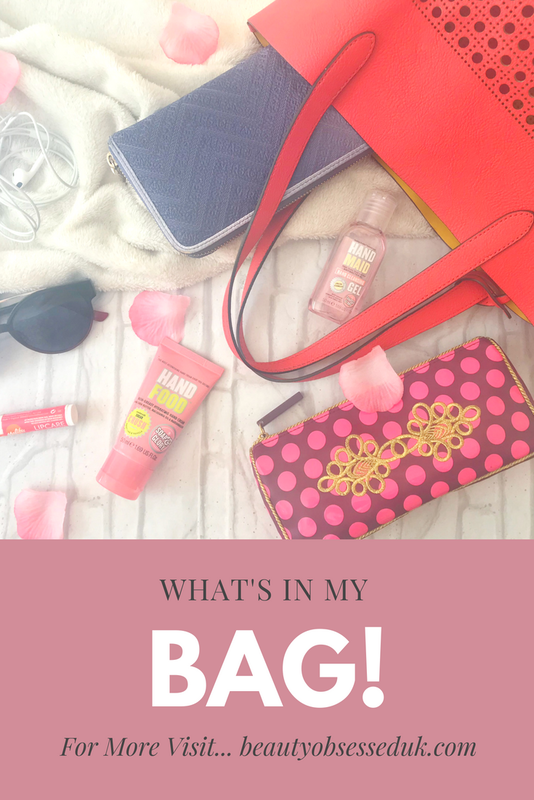 I love watching what's in my bag videos, too! This was really fun to read, and I love that red bag, it's so cute! We actually carry around a lot of the same things - I can't leave the house without my hand sanitiser and sunglasses (even if it's a rainy day!). Another essential is the pocket sized foldable hairbrush by Denman. So nifty and handy! I love a whats in my bag post. :) They are one of my favourites to read. Like you I’m always watching YouTubers videos on what’s in their bags! I loved this post, was really interesting to see what you carry, that bag is lovely by the way! Loved this! I'm so intrigued by what people carry around with them haha. This bag is gorgeous! I always carry my make-up bag with me, especially if I'm out all day. Love Soap and Glory minis! They smell amazing and they're so convenient.